It isn’t often that you will see a home having an oddly shaped layout as most homes have the standard boxy shape that seems to be more user-friendly and easier to style. So what do you do when you have a house that doesn’t conform to the traditional shapes? 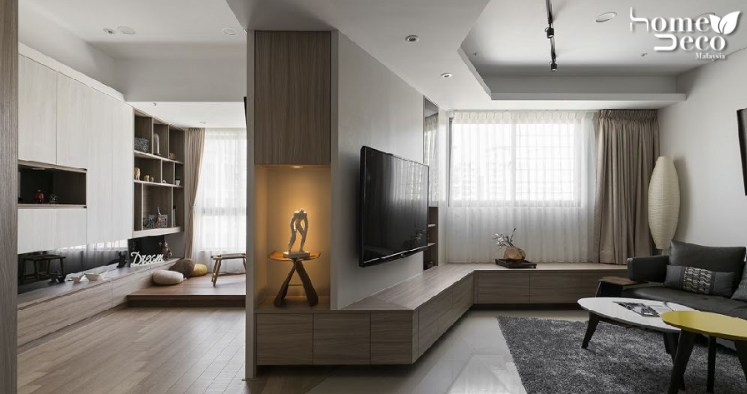 This modern minimalist residence in Taipei designed by Alfonso Ideas shows you how exactly you can do it stylishly as it has a really quirkily shaped layout. Known as Blossom, this cool house has a really interesting layout full of angles but thanks to the great design by Afonso Ideas, they all work seamlessly together and flows into a nice open space. The layout combines the living room, a sitting area, kitchen and dining area that doesn’t look odd at all. First of all, each room is separated by function and between the living room and sitting area, an octagonal wall helps to keep things neat in its own space. The wall also has another function as it serves as a great place to display your TV and entertainment centre while on the other side, you can even add built-in storage for your stuff which can be kept hidden. Both spaces use different floorings so that there is a distinct difference and the areas are separated but yet they complement each other due to the colours used. This home utilises light wood and white to create a seamless look including the dining and kitchen area. In the kitchen area, a small dining table is ready to function as an office desk if needed so that you can save space. Meanwhile, two beautiful and unusual pendant lights hang above the dining table to give it a rather elegant look while other lightings in the living room and sitting areas are more basic, as they consist of built-in and track lights. The whole residence is illuminated by lots of natural light due to the large windows so it looks very airy and spacious. All images are taken from Alfonso Ideas unless otherwise stated.